Being recognised as a Woman of Influence means a lot to Nalini Joshi. As a Georgina Sweet Australian Laureate Fellow and the first female professor at the University of Sydney’s School of Mathematics and Statistics, she is not just a passionate advocate of her discipline, but would like others to embrace maths just as she does. As an academic, Joshi is concerned that the popular perception of mathematics has changed over the decades. A lot of anxiety has been generated because mathematics has become somehow tied to a sense of performance in people’s minds. For example, school principals are reluctant to offer the opportunity to study mathematics to students whom they think may not be star performers because their results may reflect on the school’s marketability. But Joshi believes maths should be offered as an opportunity to anyone who wants to do it. The socio-political upheaval in Burma brought the Joshis to Australia back in the 1970s. Independent and free spirited, the world of numbers always fascinated the young Nalini. “My father was in the Burmese army and I grew up near jungles with wild animals. I had the freedom to explore all day long so long as I went to school and that’s what I actually seek every time I look at mathematics; it’s an adventure, an exploration, forging new paths into territories nobody else has looked at before,” she explained. As a medical practitioner, Joshi’s father wanted her to follow his footsteps and so she did, enrolling in medicine briefly, only to transfer to pure sciences, much to his chagrin. Browsing through her high school photographs recently, she realises that she was one of only two Asian faces. “I was the only one who could be described as having a different skin colour to the others. Surprisingly, this never occurred to me as a point of difference, growing up in Australia as an immigrant. I knew I was different, but I thought that was because I was an avid reader, with my face in a book most of the time, and very interested in unusual things, particularly science and space travel,” she remembered, nostalgically. At university, Joshi found her true passion. Completing a science degree with first class honours, Joshi went on to win the Sydney University medal in applied mathematics. She then moved to Princeton to complete her PhD. After stints around Australia and overseas, she returned to the University of Sydney in 2002 as Chair of Applied Mathematics. Soon after she was appointed Head of the School of Mathematics and Statistics, once again becoming the first woman to hold the position. Joshi was elected Fellow of the Australian Academy of Science and has held a number of positions with the Australian Mathematical Society, including its presidency. She was Chair of the National Committee for Mathematical Sciences and board member of the Australian Mathematics Trust. “While it takes courage and determination to succeed in most things in life, I think it took more resilience to become a successful academic, while also happening to be a woman who had children,” she admitted. Ironically, Joshi once dreamed of being an astronaut as the physics and chemistry of celestial objects and its navigational dynamics mesmerised her. Professor Joshi’s research specifically revolves around asymptotics and integrable systems, particularly the French mathematician Painleve’s six classical nonlinear equations. Quite like Joshi, Painleve was an aviation enthusiast. What distinguishes order from chaos? How can we identify systems that are integrable and only have ordered solutions? These are some of the challenges that have absorbed her analytical mind over the decades. “Amazingly, the ideas on integrable differential equations also extend to difference equations, and even to extended versions of cellular automata,” she explained. In fact these equations have important uses in many scientific fields. They can model interactions of nuclear particles, describe the behaviour of light in optical fibres and predict the motion of massive waves observed in the Andaman Sea, she added. 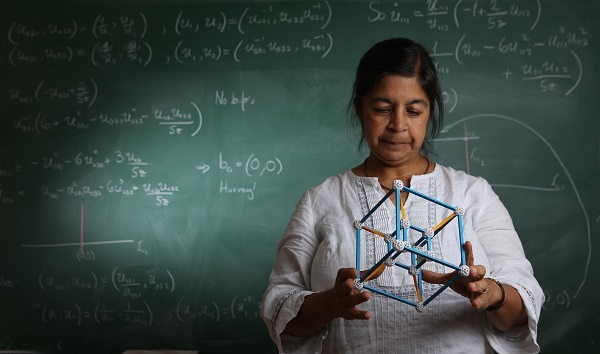 As a natural extension, her research has forged strong connections in the realm of mathematical biology. As director of the Centre for Mathematical Biology she worked on problems involving cellular automata, predicting HIV/AIDS-infected T-cell numbers in lymph nodes. Adding to an already stellar CV, most recently, Joshi was appointed to the newly created Commonwealth Science Council and became the 150th Anniversary Hardy Lecturer, awarded by the London Mathematical Society. See the Indian Link article here.